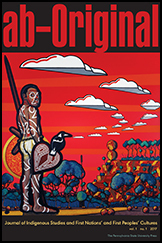 ab-Original: Journal of Indigenous Studies and First Nations’ and First Peoples’ Cultures is a journal devoted to issues of indigeneity in the new millennium. It is a multi-disciplinary journal embracing themes such as art, history, literature, politics, linguistics, health sciences and law. It is a portal for new knowledge and contemporary debate whose audience is not only that of academics and students but professionals involved in shaping policies with regard to concern relating to indigenous peoples. Each issue will consist of 40-50,000 words. All academic articles should be approximately 6-10,000 words long. An abstract of approximately 150 words must accompany each manuscript. All articles and comprehensive review essays will be peer-reviewed. Opinion pieces or short research reports, which are not peer reviewed, should be approximately 1,500 to 3,000 words in length. This entry was posted in Calls for Paper/Proposal, Resources and tagged Aboriginal and Indigenous, CFP, journal, Research.